The week I spent in Helen Michetschläger‘s workshop has been a very constructive, helpful and affirming experience. 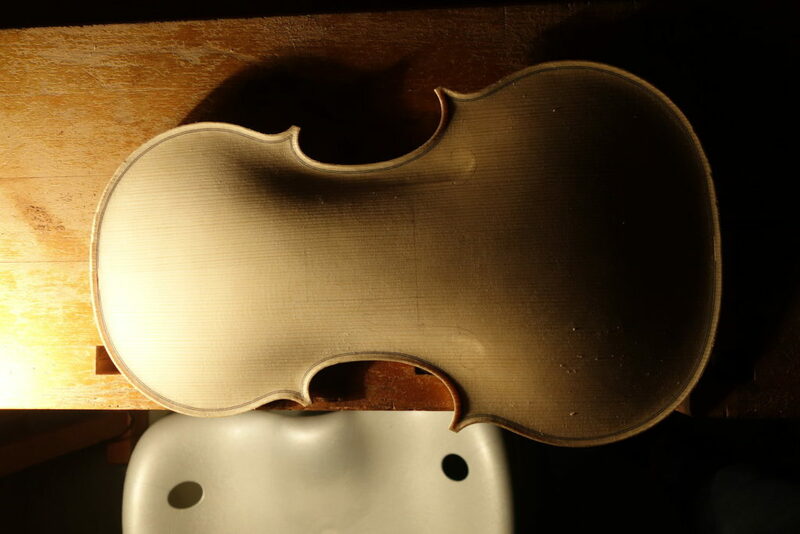 I arrived with the front and back of the 1625 Girolamo Amati viola that I’m currently working on rough arched and purfled, and the aim to work on the fluting, finish both archings, design f-holes and start hollowing by the end of the week. 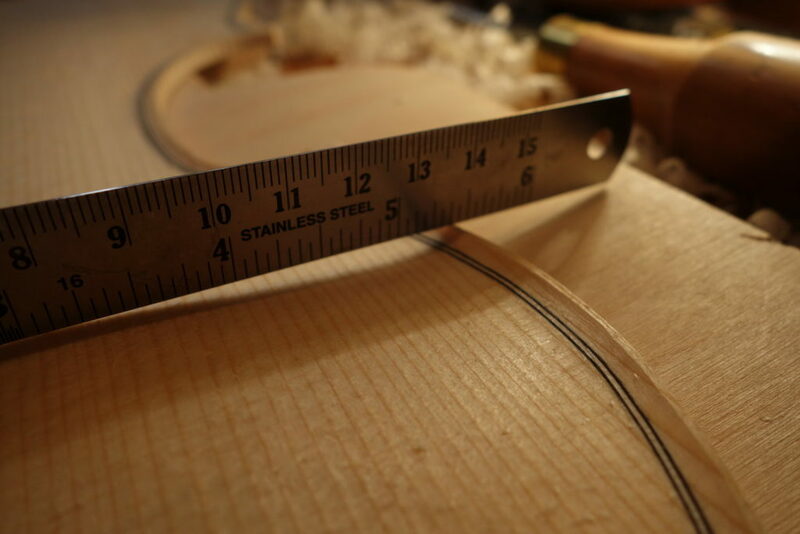 On the first day, using Helen’s scrub planes (which seem to be a revelation for every student who comes to work with her) I managed quite quickly to establish a fluent – even though overall still too high – arching shape reflecting the slightly modified arch of the original instrument. Modified in that I purposely didn’t take the points where the curves change from concave to convex quite as far in as it shows on the CT scans featured in the Scrollavezza & Zanrè book that I used for reference, and left the back about 2mm higher. Prior to cutting the fluting Helen and I examined the pictures in the book. It sometimes is puzzling how your eyes can deceive you by assuming instead of absorbing details and so it was very helpful to look at these pictures together. We found that the high point of the edge is taken relatively far out (at least 2/3 between purfling and edge), that it is very deep, but falling and rising very slowly. 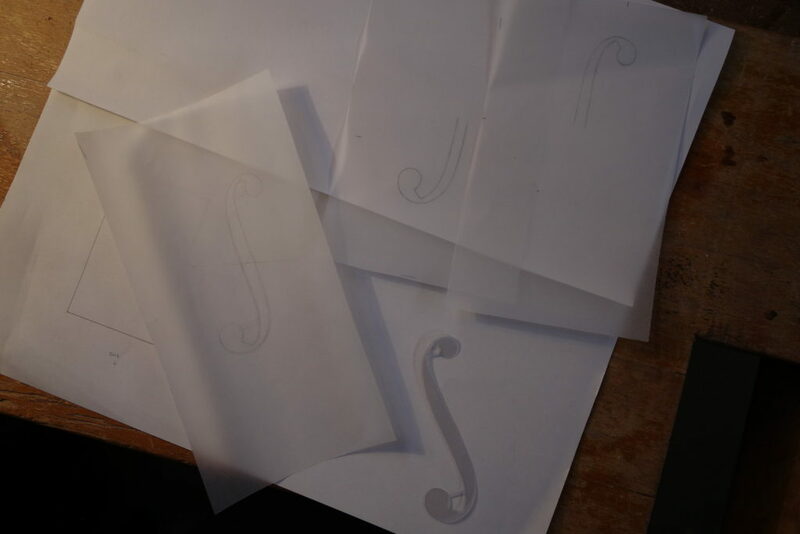 After cutting the fluting I spent a fair amount of time connecting fluting and arching where again the eyes of an experienced maker helped a lot to discover flats and to develop a better eye for fluent shapes myself. Once both plates had had their final scraping and were all smooth I designed f-holes in order to fit a sound post through them later (the f-holes have a width of 5.5mm on the original). For them to keep the style of the Girolamo Amati F-hole I then had to elongate them, too, and I think I managed to create a acceptable compromise by superimposing bits of tracing paper onto each other which each had half of the f-hole drawn on and by looking at other Girolamo Amati or Brothers Amati F-holes. The final design was then made into an inside F-hole template which I had never tried before to find out about its advantages and disadvantages compared to an outside template. I finished the week by cutting the F-hole fluting and hollowing the back to almost finished thicknesses. Again, starting off using the scrub planes allowed me to work efficiently and safely. 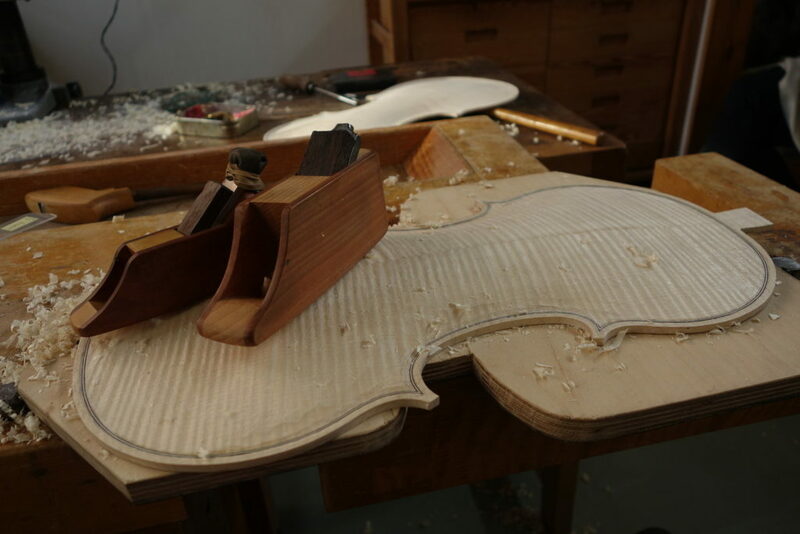 During the week I was able to watch Helen work on a viola herself and I could discover a few differences in the way she carried out certain steps in the making process and discover little tricks that make work quicker or safer, that prevent problems or promise superior results. I felt that I could identify with her rhythmic, consistent and focused way of working. That, her sincere manner and conversations about different techniques, different makers, team projects as well as personal life made the time with Helen a very reassuring experience for me.